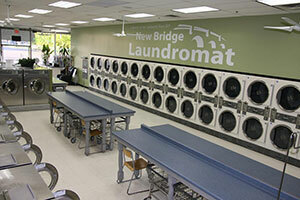 New Bridge Laundromat is the top-rated laundry facility in Bergenfield, NJ, providing residents of Bergenfield, New Milford, River Edge, Teaneck, Englewood, and Tenafly with unparalleled self-service laundry and drop off laundry delivery services. Whether you need a clean, comfortable, and convenient place to do laundry or are looking for someone to take the burden completely off you, look no further. Not only do we offer 60 state-of-the-art Huebsch washing machines for you to use at your convenience, but we also offer a free laundry pick-up and delivery service. Simply give us a call and we will be there in a jiffy to pick up, wash, fold, and deliver your laundry right to your front door. There is no easier way to get your laundry done! At New Bridge Laundromat, our team members are more than just clothes cleaners — the satisfaction of our customers is our top priority. 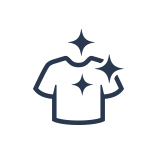 No matter what your laundry needs are, you can count on us to do everything we can to make your self service laundry trip or drop-off laundry service a breeze. Plus, our laundry experts only use top-quality Tide and Downy laundry detergents and soap for our laundry services, which you can buy right here at our laundromat. No quarters? No problem. Unlike many other coin laundry facilities in Bergenfield, we have a fully functional change machine that is available for you to use at any time. If you are in need of a modern, clean space to do laundry at an affordable price, stop by New Bridge Laundromat in Bergenfield today! Or, if you’d rather have us take care of everything for you, give us a call and we’ll set up a time to collect, wash, and deliver your laundry. Cleaning clothes to high standards is our specialty, and we look forward to serving all your laundry needs!